There are cities where particular neighbourhoods guard a memory of past disobedience and rebellion. They were in the past often referred to as working-class neighbourhoods, or quartiers populaires, to employ the French expression. They recall that past however not as something distant, to be relived only sentimentally, but rather as a living past that keeps possibilities open in the present, possibilities of contestation, protest and insurrection. Madrid’s neighbourhoods of Aluche, Usera, Vallecas are such rebellious spaces. And so too is Carabanchel, which since the advent of 15M, has strongly marked its dissident presence. After the decentralization of the occupation of the square Puerta del Sol in the centre of Madrid, at the end of May 2011, neighbourhood assemblies appeared throughout the city to continue the movement, but now in a more diffused, but potentially more effective way. The Asamblea Popular de Carabanchel was one such assembly. And it distinguished itself very quickly by stopping, more than once, public police identity checks for illegal migrants (and this the assembly would do by simply pushing the police out by force of numbers). As with other assemblies in Madrid, and elsewhere, the movement was quickly swept up by the need to somehow stop, or slow down, the massive number of home evictions that have so profoundly marked spain’s crisis. With other groups, most notably the Plataforma de Afectados por la Hipoteca, Carabanchel activists have succeeded in blocking over a hundred evictions, and have organised the occupation of empty buildings or individual apartments for housing. The Assembly has also participated in the creation of networks of solidarity and mutual aid. The Red de Derechos Sociales (Network of Social Rights) of Carabanchel is perhaps the most emblematic example in this regard. To respond to some of the more basic needs of people of the area, a number of different experiments were initiated: the collective purchasing and sharing of food, exchange and reuse of school material for children, exchange and sharing of clothing and children’s toys, a neighbourhood based skills/labour exchange, the establishment of a network of “friendly stores” (local commerce that offers discounts to the unemployed, or donates food, which again is then shared among members of the Network). All of these initiatives are collectively self-managed through open, horizontal assemblies, and their aim is not charity, but one of creating ever larger and ever more significant spaces of autonomous self-management. 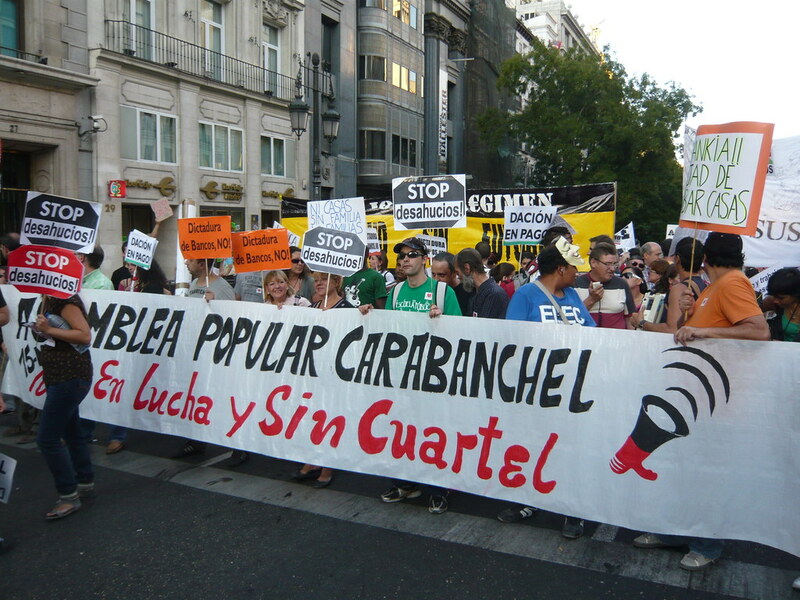 Carabanchel’s Assembly was also the driving force behind the creation of the occupied social centre, EKO at the end of 2011. The okupation is today a fundamental point of passage for numerous collectivities and associations in the neighbourhood, as well as home to various activities (children’s classes, language instruction for immigrants, the Popular University of Carabanchel, theatre and dance, and so on). The Assembly and the EKO collective have also created a network of urban gardens through the occupation of unused lands. If the emphasis here is on 15M inspired activities, these last do not exhaust the neighbourhood’s radical life. To cite but some of the more noteworthy collectives: La Casa del Barrio, La Asemblea de Trabajadores de Carabanchel (ATRAKA), CSOA La Gatonera, Vaciador 34, La Nave, Carabanceleando, Asemblea Libertaria de Carabanchel … and examples continue. What all of these projects, initiatives, activities point to, however modestly, and even sometimes unclearly, are ways of life that push against the limits of State-Capital; they seek to give shape to forms of social life outside/beyond money, the market, commodity exchange, and hierarchies of power. They make real a slogan that accompanied many in 15M protests: “Alone you cannot, with friends you can.” For those who participate, it is fear that is lost, and with it comes the courage to create oneself freely. 1. The self-organisation of consumption: collective shopping that renders goods cheaper and/or from producers who treat more justly persons and the environment. 2. Self organization of production: our own production of the resources that are within our reach. 3. Collectivisation of our own means of production, that allow for buying increasingly less and producing more by ourselves. Though we have a goal which guides us, we would also like to start now taking the first material steps, such that our very action defines the project. In this way, we would like to decide upon one aspect of each of these three areas to be initiated now. For example, it could be: the collective purchase of cleaning products, the production of bread, the acquisition of a sewing machine and confection tools; or any other combination that we decide upon and which we are prepared to begin in the short term. This entry was posted in Commentary, News blog and tagged Carabanchel, Plataforma de Afectados por la Hipoteca, rebellion, revolution, spain. Bookmark the permalink.